The climax of Flame of Findul takes place within the cone of Mount St. Helens, so I had to learn a bit about the mountain. It’s located in the southwestern corner of Washington state, in the Cascade Range, and it’s absolutely gorgeous. 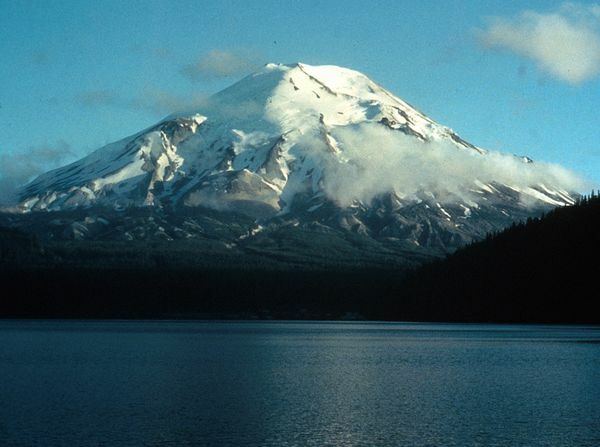 Mount St. Helens is an active volcano that last erupted in 1980. I vaguely remember that hitting the news as a young kid. To make my story work, I needed to become acquainted with the geological features surrounding the mountain and come up with the best way to approach it from sea. Fortunately, the Columbia River runs nearby with a tributary that practically runs over the mountain’s toes. The tributary, the Louis River, is dammed in three spots, forming three linked reservoirs. You can see them in the photo above. With a bit of imagination, this worked out very nicely for my plot. Mount St. Helens before the 1980 eruption. Beautiful, wasn’t it? Then I had to get my characters up the mountain. It just so happened that the reservoirs are on the south side of the mountain, not the north side that got blown to bits in the eruption, which made my characters ascent from the water much easier and more practical. In late April/early May, when this scene takes place, the most direct southern path to the peak is still closed, making it an ideal time to send my troops up (as no hikers would get in the way). I had to be aware of normal weather conditions, the trail’s physical condition, distance, and the length of time it might take to hike to the top. After that, my characters descend into the cone, which is strictly prohibited by law. Sorry, National Park Service, they went down anyway. Then my one-page journey to the center of the volcano felt much like an abbreviated version of one I traveled in a Jules Verne book last year. 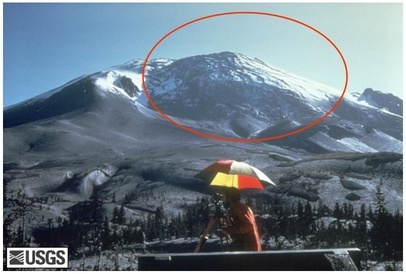 The bulge in the north face just prior to the eruption. 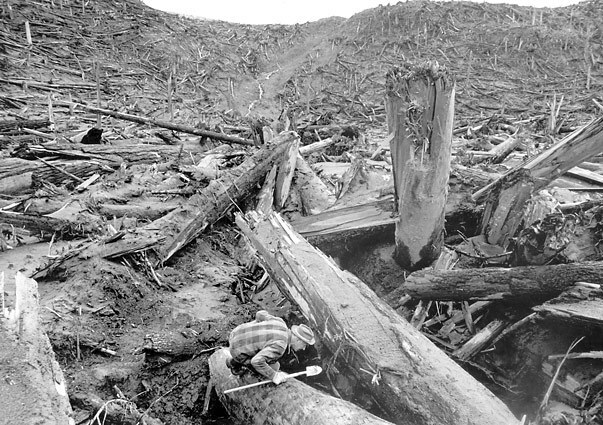 Mount St. Helens is most notorious for its catastrophic eruption on May 18, 1980, at 8:32 am PDT, the deadliest and most economically destructive volcanic event in the history of the United States. Fifty-seven people were killed; 250 homes, 47 bridges, 15 miles (24 km) of railways, and 185 miles (298 km) of highway were destroyed. A massive debris avalanche triggered by an earthquake measuring 5.1 on the Richter scale, caused an eruption, reducing the elevation of the mountain’s summit from 9,677 ft (2,950 m) to 8,365 ft (2,550 m) and replacing it with a 1 mile (1.6 km) wide horseshoe-shaped crater. The debris avalanche was up to 0.7 cubic miles (2.9 km3) in volume. Destruction in the blast zone. The northern side of the cone was completely obliterated. 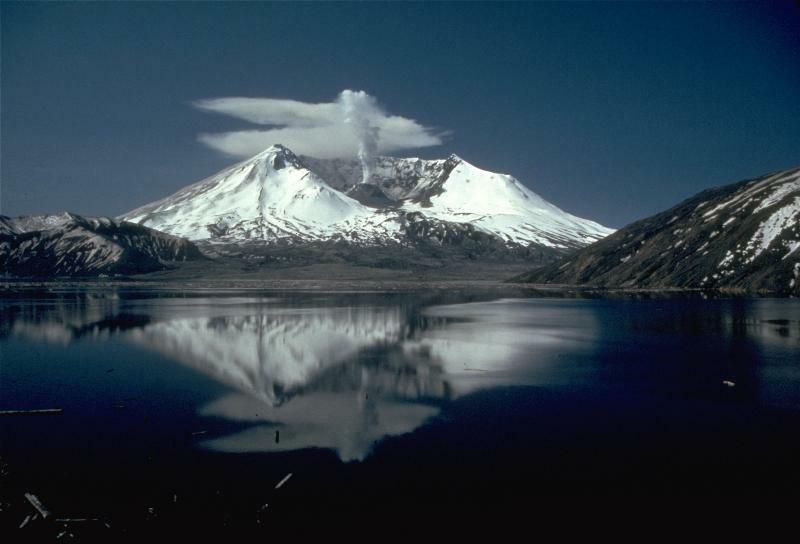 The region has since been protected as the Mount Saint Helens National Volcanic Monument and provides a wealth of scientific data. (Interestingly enough, much of what’s been learned blows holes into geological evolutionary theory of millions of years and provides tremendous evidence for a catastrophic Flood.) The volcano remains active, and the way the region has rejuvenated is nothing less than amazing. Here’s a 6-1/2 minute video on the eruption with some awesome slow motion footage of the blast. Next week I should be announcing the release of Taylor Davis! WOW – Taylor is on some journey. Mt Saint Helens. I remember being glued to that eruption. The picture of the bulging side should have been a huge warning– the side looks like it’s pregnant and ready to give birth. 🙂 Looking forward to this story. Yeah, that picture is crazy! I would NOT have been the fella in truck. Taylor has been a real exercise in pushing a plot past where I’m comfortable taking it. Not my favorite kind of literature, but definitely fun. But, I’m sure it will be good! I can’t wait for Taylor Davis to come out! I liked learning about Mount St Helens! Loved the pictures! Mt. St. Helen’s erupted on my birthday in 1980 and I have always been curious about it. I was able to go to an observatory and museum near the mountain about 10 years ago. It was so interesting! Best of luck with the research. That’s a cool connection, Stephanie. I would love to go see it. We went to see Mount Rainier two years after St. Helens blew up, but I’ve never seen Mount St. Helens. I guess that year wouldn’t have been a great one to visit it, huh? Rainier was gorgeous.